I waited so many months for this dress all the way back to August when I showed the Fall/Spring preview so when I got word that it was online I bought it asap. I had been hunting for the last year for the most perfect shirt/swing dress and what luck Micheline Pitt had already created it. This my lovely readers is now my favorite dress in my closet! The Haunted House-wife Dress in Black Stretch Sateen with White Piping and white skull buttons - Could this be any more perfect? I am wearing an XL (sizes come in XS-2X) and its a perfect fit! It fits snugly but still has a little give. The arms are very fitted and have a small amount of stretch. If you own the Doris Top in an XL you will fit just like me in this dress. This dress is also made in Red with Black piping! It fits like a glove and really makes you feel fantastic, I've worn this out a few times and even on Christmas day, the full skirt cam in handy when I pigged out! It actually comes with a matching belt but I'm not a fan of skinnier belts with my waist line so I took one of the many black belts I have from my other Pinup Girl Clothing dresses and I think it goes perfectly. Teamed up with my Glamor Guts Pumps from Iron Fist Australia $112AU which I think match perfectly. I also can't control my urge to twirl when I'm wearing this stunning dress. I only got this a week before Christmas but sadly they have all sold out in both colours black and red. But if you add yourself to the waitlist they will email you as soon as they get more stock in. Myself and so many other girls were watching Pinup Girl Clothing's facebook page so we all snatched them up very fast. Though sadly this dress has sold out you can add yourself to the waitlist so you can snap this dress up as soon as it returns. They also offer two other dresses that have a simular style that I adore just as much as this design. The Audrey Skirt in black and pink, I've been looking everywhere for a good swing/circle skirt so I can't wait for this to come out. This is teamed up with the Pinup Couture Boat Neck Top. The Doris Top - I can't put into words how amazing the fit is on this stunning item. Now a new colour to add to the collection, green always wins me over. Pinup Couture Pencil Skirt in Black Cherry Sateen is also super cute, i'm not a fan of cherries but it matches perfectly with the new doris top. Great Job Teer! I agree that the HH is a must have. Just got mine yesterday and can't wait for any excuse to wear it. Beautiful pics! I have had the HH Dress in my online cart a dozen times and have taken it out. I am concerned about the sleeves. I used to be a bodybuilder and have larger than average arms. I am thinking of getting it in a 2X for that reason but am afraid that it won't be beautifully fitted where I want it to be. My measurements are 43/32/46-- any thoughts? As I mentioned it is rather tight in the arms, its very snug. So I would advise you get the 2xl and get it taken in at your waist if possible. I was fearing the same thing but it fits perfectly snug. I just measured my arms and at the wides part they are 14 - 14.5 inches around. You look gorgeous as always Teer! And I 100% agree with you, my HH dress is my favourite thing in my closet. I've only worn it once so far (it is a bit too warm in NZ right now for the heavy fabric), but I got so many comments on it, way more than anything else I own. Once again, PUG proves why they are my favourite store! p.s. I love the sneak peeks, I hadn't seen those yet! The Doris in green = must have!!! Out of the new stock I really, really, really want the first outfit head to toe! I've been wanting those Pinup Couture Pumps for so long! holy smurf, those are some of the most beautiful dresses and skirts. Love the dress on you, extremely flattering. 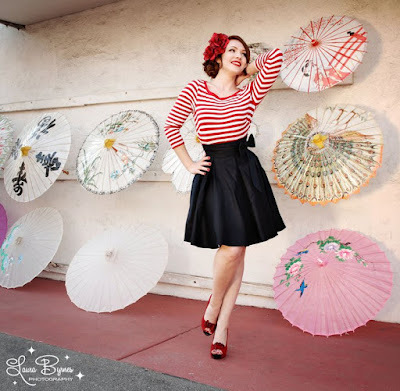 I've been dying at the idea of getting a dress from pinupgirlclothing.com but I can't afford it just yet, in time! That twirl photo is beyond incredible, you fox! The pinupgirl site kills me, as they're just a couple inches off my measurements. KILLS ME. OMG wow! Seriously. That is one fabulous dress. And the alternatives aren't bad either. :o) thanks for sharing.